HEIRLOOM. Superb for bedding or containers. 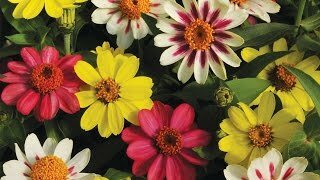 An abundance of 2-3" double spurred flowers bloom in a harmony of color. Superb for bedding or containers. Nasturtium may be grown from seed sown early indoors and transplanted outside after frost, or sown directly in the garden after frost, or grown from potted plants. Note: When sowing from seed, before sowing, gently rub the seed with a nail file to aid germination, as nasturtium has a hard seed coat. Sow indoors 4-6 weeks before the last frost using a seed starting kit. It is best to use a large celled kit, or fiber pots as nasturtium roots are easily damaged when transplanting. Direct sow seeds in average soil in full sun after all danger of frost. Sow seeds ½ inch deep 12 inches apart. Firm soil lightly, water and keep evenly moist. Seedlings will emerge in 10-14 days. Select a location in full sun with moist, well drained organic soil. Set level with the surrounding soil. Fill with soil to the top of the root ball. Press soil down firmly with your hand leaving a slight depression around the plant to hold water. Be careful to not disturb the roots as nasturtiums can resent being transplanted. Do not over fertilize as nasturtiums prefer a poor soil. Climbing varieties will need some training and support on their upward journey. Deadhead to keep plants flowering longer. Nasturtiums do best in areas with relatively cool summers, but usually, they can grow anywhere. Nasturtiums cut for vases often root in water. Nasturtiums are pretty annuals to use as edgings or at the front of a flower bed with other low-growing annuals and perennials. Allow plants to trail over walls or raised beds, and use them to add summertime color to rock gardens. They also look beautiful in containers and window boxes. Nasturtium, Double Dwarf Jewel Mix is rated 5.0 out of 5 by 6. Rated 5 out of 5 by AllyE from Gorgeous I sowed most these directly outside in early June and would recommend that method. All of the seedlings I started indoors earlier in the spring died after I transplanted them outside. The ones I sowed outside were a little slow to start but are now beautiful, healthy and producing literally dozens of new flowers a day. They're amazing. Rated 5 out of 5 by Lmali from Rich colors and tasty too! I planted these in containers on my front porch and in my raised beds to help attract pollinators to my cucumbers. The ones in the containers never got terribly big and always looked a bit stunted, but the ones in the raised beds....wow! They got so big they eventually spilled over the sides. They were planted in April but got a slow start due to unseasonably chilly spring weather, but they had tons of blossoms open by mid-June when the attached picture was taken. Those original plants have died off now some time ago, but they reseeded themselves several times so I still have nasturtiums blooming in the same place now in September. For those who like to have their flowers and eat them too, the flavor on these is excellent. I never got around to eating the flowers themselves, but every time I made a batch of basil pesto I would toss in some nasturtium leaves and they lent a wonderfully complex, peppery taste to the blend. They produced seeds as prolifically as they produced flowers and I was able to save more than three times as many as I planted. This one is going on the replant list for sure! Rated 5 out of 5 by GAGardeningGal from Just beautiful! Nasturtiums are one of my favorite flowers, and they are so easy to grow too. They are just lovely planted among the vegetables in my vegetable garden, along with marigolds and petunias. Besides their beauty, I use them to deter garden pests just like my fellow gardners do. Great germination with Burpee seeds, too! Rated 5 out of 5 by GardenGirl88 from Beautiful!! I planted these in a row beside my tomatoes to keep bugs away, but I couldn't resist cutting them for indoor arrangements. They smelled wonderful in combination with other flowers, and they bloomed continuously through the season. I would highly recommend these for border plants, as they were covered in blooms which hid a lot of the greenery. They are also very easy to start from seed directly in your garden. Rated 5 out of 5 by ChristyACB from Gorgeous and Care Free I plant nasturtiums in my raised Square Foot Garden for natural pest control and while I can't attest to how well it may or may not have done that, I can attest to the lovely and vigorous nature of this flower. Started from seed, there is a little wait involved and the plants seems to stay just a small cluster of leaves for longer than other nasturtiums, but then it suddenly just takes off and produces flowers fast. The colors are true and vibrant, creating a bright focal point in the vegetable garden.